Waiting for Gonzo is a brilliant read and I enjoyed it thoroughly. 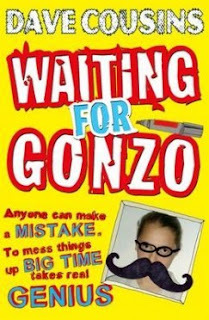 Waiting for Gonzo is the story of Oz after he is moved by his family to live in the middle of nowhere. He has all the teenage problems that comes with starting a new school and being forced to make new friends. What I loved about this book was that Oz was just a normal teenager. I loved how underneath it all he had a heart of gold but he still messed up and got things wrong and as a consequence had to do damage control to make things right again. I particularly enjoyed the relationship he had with his sister and loved that despite all their bickering they actually had each others back at the end of the day. As I've come to expect from a Dave Cousins the book has some really brilliantly funny moments which made me giggle. A highly recommended and heartfelt tale which I enjoyed thoroughly.